You are here: Home>Archive>Taylor Brown Collection.>Marriages.>Wedding invitation for Maisie Agnes Brown. Wedding invitation for Maisie Agnes Brown. 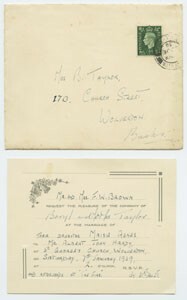 Small card wedding invitation in an envelope addressed to Miss B. Taylor, 170 Church Street, Wolverton, Bucks. The invitation is from Mr. and Mrs. F.W. Brown inviting Beryl and her parents to their daughter’s wedding. It is a cream coloured card with silver edging with a bells and flowers motif in the top left hand corner.